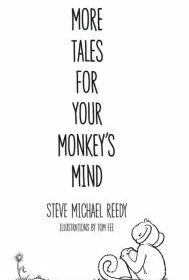 Steve Michael Reedy delivers his second volume of delightful short stories for children in More Tales for Your Monkey’s Mind. In this collection of six fables, Reedy, a children’s counselor and former youth theater teacher, displays familiarity with the concerns children face and a facility at engaging them. Each story features a child between the ages of seven and 12 and richly details their town and its predicament. For example, nasty pink bunnies who hurl insults at everyone invade one otherwise idyllic hamlet; a clock rules over the lives of another village’s inhabitants, and an entire town sleeps while one girl awakes to wonder about what is real and what is a dream. Ultimately, the tales show how the children come to terms with such odd circumstances. Although formulaic in structure, the imaginative scenarios are captivating, while Tom Fee’s pen-and-ink line drawings bring the action to life. Reedy employs Seuss-like rhyming, both as separate stanzas and interspersed within prose passages. Chef Tubblygras, for example, alternates between speaking plainly and then outlining her plans entirely in verse, as she begins, “You see, my dear. Your poor, naïve little town isn’t the only one I plan on taking down.” Overall, this lyricism makes reading the text aloud enjoyable (although it can occasionally seem overused). Overall, readers will find this an entertaining collection of empowering children’s tales—one that is sure to enrich family storytime.